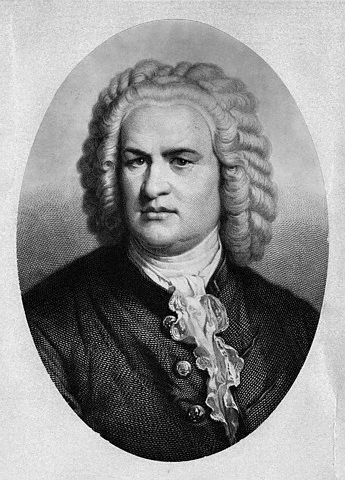 Johann Sebastian Bach (1685-1750) was a German composer and born to a family of professional musicians. Bach was also a famous organist. As a young teacher he got into trouble with the Arnstady authorities over a public brawl with one of his students. Bach, while walking across the market-place in the company of his cousin, Barbara Catharina, was confronted by J. H. Greyersbach and five fellow students returning from a christening feast. Geyersbach demanded to know why Bach had impugned his abilities as a bassoonist. As tempers rose, he called Bach ‘a dirty dog’ and lashed his face with a stick. Bach drew his sword and only the intervention of another student averted bloodshed. When Bach complained, the Consistory determined that he had been principally at fault for having called Greyersbach ‘a nanny-goat bassoonist’. He was admonished to try and live in peace with his students. Bach’s reaction was to take a prolonged and unauthorized journey to Lubeck, to listen to the organ playing of Buxtehude. Johann Sebastian Bach's parents knew that he was special from a very early age. His father, Johann Ambrosius Bach, had a twin brother who looked so similar that even their wives had difficulty telling them apart. (Even their musical styles were nearly identical.) When Johann Sebastian was born (on March 21, 1685), however, his mother found a way to identify her husband; he was the one the baby called "Papa." Johann Sebastian Bach was not without his critics. "All Bach's last movements," Arnold Bax once remarked, "are like the running of a sewing machine." He was so fond of full harmony that, besides a constant and active use of the pedals, he is said to have put down such keys by a stick in his mouth, as neither hands nor feet could reach. Though Johann Sebastian Bach was a brilliant organist, his tenure as a Cantor in Leipzig was blemished by his irresponsible behavior. According to contemporary records, he was reproved by the town council for being a "loner," for his arrogant manner, for neglecting his duties (he once walked 230 miles from Arnstadt to Lübeck to hear Dietrich Buxtehude play the organ), for playing strange melodies on the organ during church services, for playing too long and, in defiance, deliberately playing too short. A resolution was once unanimously passed by the Council "to ask Bach by what right he recently caused a strange maiden to be invited into the choir loft, and let her make music there." The capper, however, came when Bach was asked to visit a neighboring town to inspect a new organ. He showed up at the correct hour - four months late!